In the early 1960s, Roy Lichtenstein appropriated comic book images, intending to transform his popular sources into a “high art” form. Like Warhol, he also incorporated mechanized processes based on those used in the commercial art of his day. In Lichtenstein’s case, stencils were used to produce enlarged Benday dots, as well as cartoon figures, and balloons with words. 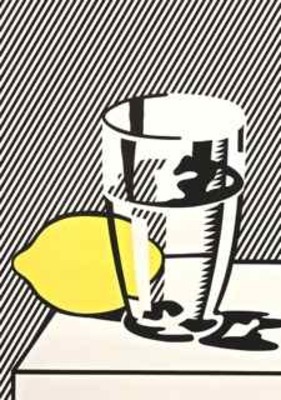 The artwork on display by Lichtenstein from the For Meyer Schapiro print portfolio coincides with a series of still-life paintings Lichtenstein made in a variety of styles during the mid 1970s.